I used my lunch hour today to attend Arista’s product launch webinar entitled “The Next Era of Software Defined Cloud Networking”, and type up a few comments in this post. It wasn’t everything I had hoped for given the nature of the headline; nothing as earth-movingly amazing as one might have thought, but nonetheless they are positioning an interesting product for their customers. Unfortunately when I hear the word Spline, I think of splinching from the world of Harry Potter, which is not such a pleasant association. It seems that Arista’s marketing department wishes to conjure up images of a device that sits architecturally between leaf and spine, which is exactly where these products are positioned. The new products on the table are the X-Series 7250X and 7300X Ethernet switches. 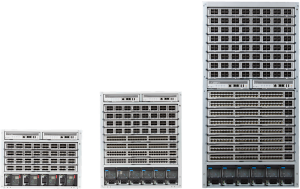 The 7250X offers 64 x 40G or 256 x 10G ports in a 2U fixed form factor. The 7300X represents a group of modular chassis with a high density of 10G/40G ports, and in fact with the 16 slot chassis, the port density exceeds that of its big brother, the 7500E. The 7250X and 7300X sit right in the middle of Arista’s existing offerings. At the leaf end is the existing 7050X for example – 1U and 2U fixed form factor switches; for the spine, Arista position the 7500 series; and in the middle we find the 7250X and 7300X switches. The modular 7300X in particular is positioned as a leaf, a spine, or a ‘spline’ (a collapsed leaf spine) node supporting between 100 and 1000 servers. The argument here is that this collapsed ‘Spline™’ (yes apparently it’s trademarked) will cost 40% less than a leaf-spine deployment for 768 10G ports. So why choose a 7300 over a 7500? Price for one – the 7300 will be cheaper than the 7500, but with the compromises that go with it. Rather than the 7500’s cell-based VoQ (virtual output queue) based switch fabric which achieves lossless 100% loading, the 7300 can only achieve 90% loading on its multi-chip bandwidth-aware flow-hashing Clos fabric. For buffering, the 7500 has – if I heard right – 1000 times more buffer than the 7300. On the other hand, the 7300 achieves 2ms2µs latency versus 45ms4µs on the 7500. It’s all about balancing priorities I guess. Like the other offerings, these new switches run Arista’s linux-based EOS operating system, and Arista claim that they are programmable “at every level”, and offer Puppet, Chef and Splunk, VMWare, Microsoft and Openstack integration. My SDDC Bingo Card was filling up pretty quickly today, but the ability to provision the switches through OpenStack for example brings this switch firmly into the cloud orchestration arena. I was a little surprised not to hear any mention of OpenDaylight given that Arista is a Silver Member of the project you’d hope they might give it a nod in passing. The webinar featured a video clip from somebody at Microsoft talking about how they valued their relationship with Arista and were delighted that Arista were involved with Microsoft in developing NVGRE. I’m no expert here, but when I looked at the IETF docs, I’m pretty sure I saw the same name from Arista (K. Duda) as an author on both the NVGRE and VXLAN drafts. I haven’t kept up with the movements, but it seems to me that – entirely reasonably – Arista are betting on both teams, which rather taints the idea of the special relationship between the two companies. Ah well, just my own speculations there. I guess I should be glad that K. Duda does not also show up on the STT draft, right? Arista was also pleased to announce a new 40G LRL4 optic which will support up to 1km runs using Single Mode Fiber (SMF). Arista compared this to current Multi-Mode Fiber (MMF) interfaces that offered up to 550m for 1G, 300m for 10G (SR4) and only 100m for 40G using 4x25G modules. Their advice is that for larger installations, customers must start deploying SMF in the data center now in order to be ready to support 40 and 100G links in the future. At the end of the ‘live’ webinar (I actually kind of assumed it was a replay of an earlier briefing, but it wasn’t clear), there was a brief Q&A session. I have to say that based on both the nature of the questions and the fact that the answers sounded like they were being read from cue cards, my assumption is that all the questions were in fact staged and prepared (there were such unsubtle digs at Cisco’s confused product strategy for example, that it was all a little too easy in my opinion). I was a little surprised therefore when the host made a joke about his last question being a ‘canned’ question, unlike the previous questions. Really? That was the only canned question? Color me disbelief-colored; I honestly do not believe there was a single live customer question in there. Is This the “Next Era of Software Defined Cloud Networking”? Uh no, I don’t think that Arista successfully made that case. But it’s an interesting new product, and I’ll be watching with interest, especially as the technical deep dives start occurring. Seeing how this stacks up against the upcoming Cisco / Insieme launch will perhaps give some more insight as to whether Arista has a winner on their hands. I believe the latency number in this blog is wrong. Based on Arista product data sheet, 7300 latency is below 2usec while 7500 is below 4usec. Yikes – thanks for catching the ms error. I have changed ms to us immediately. Meanwhile I’ll go back on the figures – 45 might be a typo, but I’d like to go find my original notes and see what I wrote down. I will correct as required. Thanks again! Yep, a big ol’ fat finger. Correct to 4us. Thank you and sorry for the error.